Piers Corbyn, astrophysicist, is the originator of the revolutionary and highly successful Solar Weather Technique of long-range forecasting and founder of Weather Action Long Range forecasters. 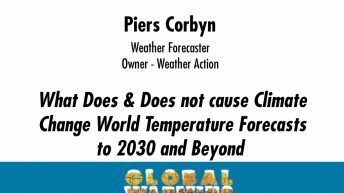 He totally rejects the CO2-based theory of global warming and climate change and has shown that existing published scientific research demonstrates there is no evidence for the CO2-based theory – only evidence against. Recently he and other scientists have directly challenged the United Nations Intergovernmental Panel on Climate Change (IPCC) to admit that the CO2-centered theory has failed.